Aromatherapy | Bartok design Co. Aromatherapy – Page 2 – Bartok design Co. This oil was developed thru a crowdfunding campaign run in the fall of 2014. The oil can be used in the bath (we recommend to pour on hinoki orbs or wood blocks and place in the water) or in your aroma diffuser. The aroma is very different from normal hinoki, I would describe it as spicier and milder at the same time. You can purchase it thru Paypal or contact us. 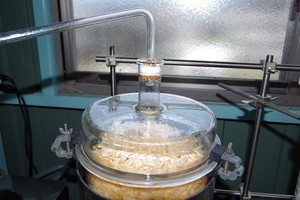 Hinoki oil is obtained by steam distillation of hinoki wood trunk pulp. On the left you can see our small size testing drum which holds 500g of wood chips. No addictive or chemical is used. After reiterating the process 4 times, the yield is about 1% which means that 1Kg of hinoki contains about 10ml of essential oil. Hinoki aroma oil is the beloved delicate, citrus-scented quintessential japanese essential oil. 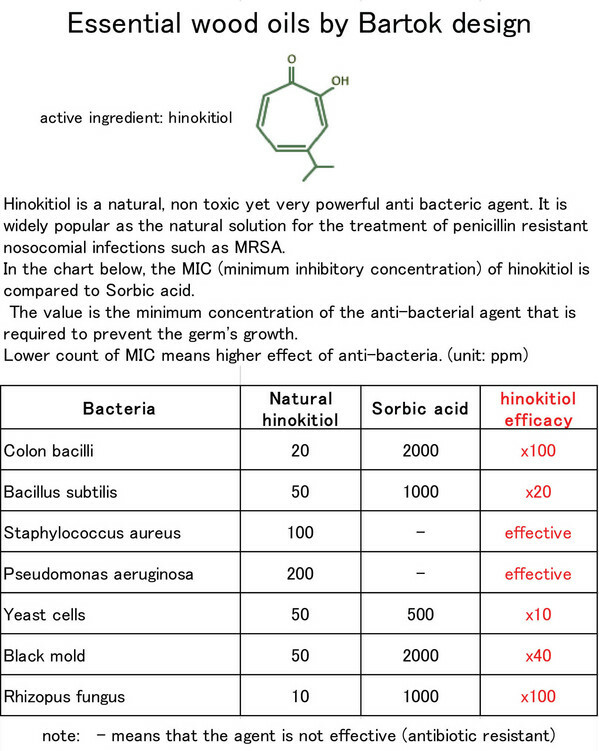 Hinokitiol is the miraculous terpenoid with high bactericidal power. It is even effective on penicillin resistant nosocomial infections such as MRSA, and it is all natural! We provide hinokitiol powder in you can add to the oil (in 5%, 10%, 15% concentrations) for enhanced skin care and skin healing performance. 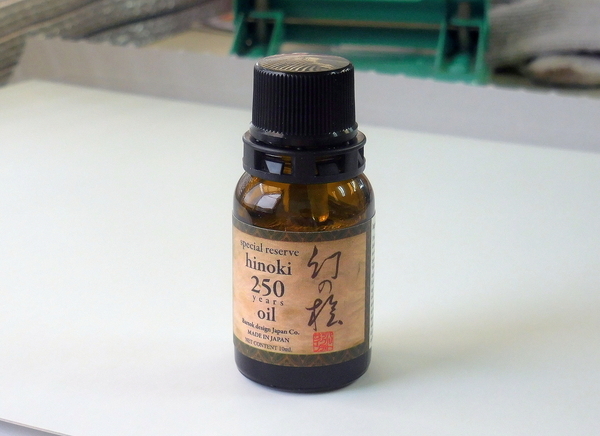 We sell 100% pure japanese hinoki oil (extracted thru steam distillation of the trunk heartwood) in 10ml bottles. We also offer bottles of pure hinokitiol crystals in 1.0g　bottles. To contain the costs and to provide always fresh stock, we discontinued the pre-mixed hinoki oil + hinokitiol but offer the 2 products together in a value package. 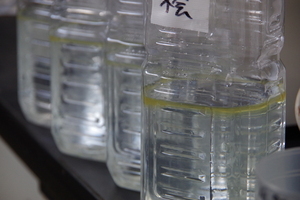 You can prepare easily the enriched hinoki oil at your home. Pour the hinokitiol powder inside with the aid of a small pad or toothpick and mix it with the hinokitiol to obtain the desired concentration. Adding 1g of hinokitiol to 10ml of hinoki oil would give you a 12% hinokitiol solution. About 6 times the concentration present in hiba oil. You can apply the oil directly on the skin (try first a small amount) or place few drops in water used for washing or in the bathtub. Remember that oil becomes soluble in water when mixed with ethanol (ethyl alcohol). Please purchase separately ethanol at your drugstore. Hinokitiol is used as a component for soaps, scalp treatments, skin acne treatments. Chemically, it is tropolone and is extracted from hiba oil with a laborious ultrasonication process which takes about 6 months. 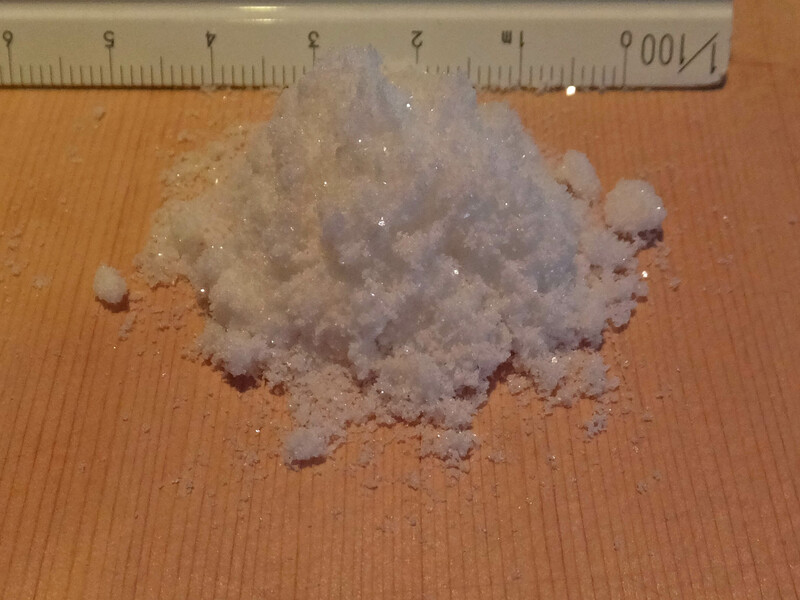 In the picture below is 1g of hinokitiol powder. Hinokitiol has a natural bactericidal action and can prevent skin scaling, dandruff, acne or atopic dermatitis (eczema). It can be used as a treatment for skin diseases. Hiba oil has a very strong forest scent, reminescent of cedarwood, maybe too intense for many people, especially ladies. Also, even though allergic reactions are very rare, concentrate application of hiba oil directly on skin may cause a temporary rush and itching. On the other hand, the hiba oil has a natural content of hinokitiol (about 2%) which makes it an asset when used against skin infections or for food preservation. For this reason, we extracted pure hinokitiol (powder) and add it to hinoki oil which has a more gentle and widely appreciated aroma. Please contact us for more details and bulk purchase options. We are now testing this product with about 100 dermatologists and aromatherapists around the globe and will be glad to provide a sample upon request. Please check our shop pages for purchasing hinoki oil. Onsen is the japanese hot spring. Bathing in a Japanese wooden tub is a life changing experience. It is relaxing and stimulating at the same time, stress relieving, it even alleviates skin and respiratory problems. Are you dreaming of owning a Japanese bathtub but do not have the space or the money? We recommend you to try few drops of hinoki wood essential oil in your acrylic or porcelain enamel coated bathtub. It is not the same thing but it is close enough to the feeling of soaking in a real onsen, additionally you can enjoy the same curative effects! 1) healthy bath:. add 3-5 drops to hot water before bathing. 1″) alternatively, pour few drops on hinoki balls (sold separately) and place them in the hot water. 2) aromatherapy: use with your preferred diffuser. 3) disinfectant: dissolve 10 drops in a liter of water to wash hands or a scar. 4) skin treatment: It may be applied directly on skin. We recommend to try first in a small area and verify any allergic reaction. Stop direct application and consult with your doctor in case of allergic reaction. We also offer hinoki wood balls which have aromatic properties. If you place them in hot water, you will enjoy even more the delicate aroma. They are also very light-weighted and warm and it is very pleasant to grasp them and hold in the hand for relaxation/rehabilitation. 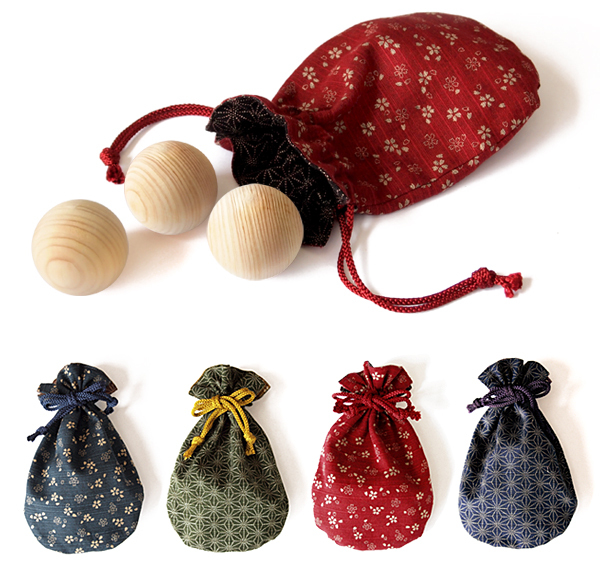 The size is 44mm (baby safe as they cannot be swallowed) and the package consists of 3 balls in a kimono fabric pouch. We have 4 colors available. The pouches are fully reversible so you can actually choose between 8 colors. For this reason we recommend to combine the use of aroma balls and aroma oil. We created a kit called “pocket onsen” which consists of a pouch with the aroma orbs and one bottle of aroma oil, nicely packaged in a wooden box. 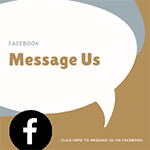 Please find more information in the section about aroma oils. USAGE: just place few drops of hinoki oil on the wooden balls and put in the water. You will feel like you are in some ancient japanese bathhouse enjoying your bath ritual! It is called Hiba cypress or “arborvitae”, and refuses to co-exist with other trees. Hiba is a tree native of Japan, additionally we can say that about 80% of the hiba trees are located in Japan, in the Aomori prefecture. 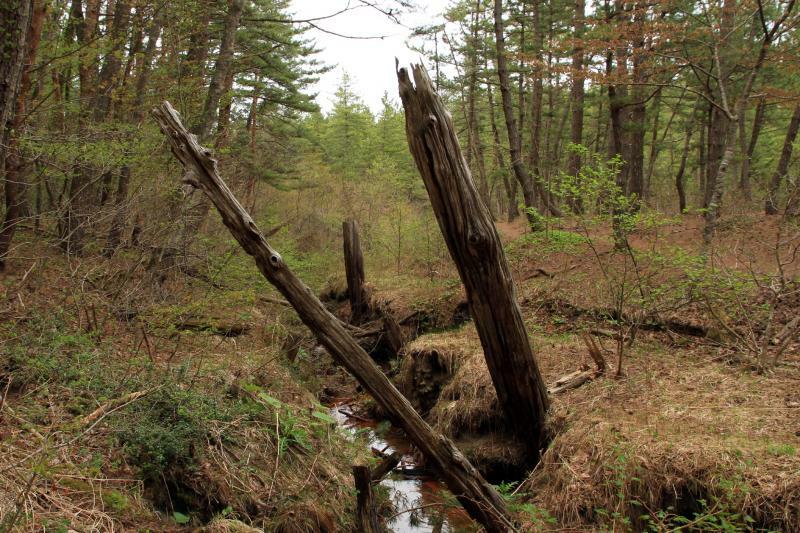 Forests have an average age of 200-250 years, it is a tree that grows over the years slowly tempered by the harsh wind and snow of the northern japanese region. Together with hinoki and sugi pine, hiba is one of the three large trees of Japan and as a building material it is considered “first class” for its resistance to rot. Hiba is used in construction and together with hinoki it has the honor of being preferred for the construction of shinto shrines. Hiba hard to rot quality is surprising compared to other trees: we can often find in the mountains leftovers of wood logged 100 years ago and the heatwood is in perfect conditions, it even maintains its fresh fragrance! 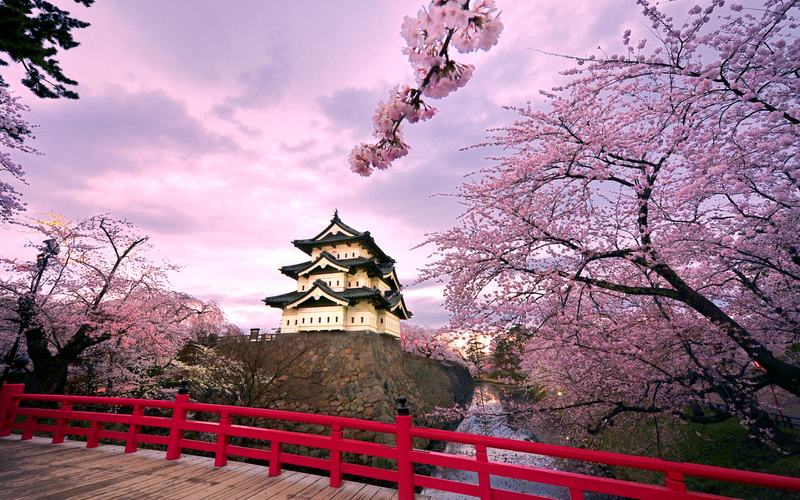 Hiba is used in history many buildings Including Hirosaki Castle, this is also proves its resistance to rot in the humid japanese weather. The reason of its resilience is its high content of hinokitiol (also known as Thujopsene). This natural chemical compound in the family of terpenes and was first isolated in Taiwan hinoki: this is the reason for the name. Actually, it is contained in very small amount in Taiwan hinoki, and even less in Japanese hinoki. We are now adding to our line-up of product the hinoki wood aroma oil. There is a saying: “in a house made of hiba, mosquitos do not come for 3 years”. Synonyms: Thuja dolobrata, Thuja, Hiba, Aomori Hiba, Asnaro, Arborvitae. Plant Part: wood (no bark or leaves). Actually we extract the oil from wood chips and construction material scraps of Aomori Hiba tree. This means that the wood is all from the core of the plant (it does not contain sapwood). Another statement we can make is that this is a 100% ecological material. No single tree has been cut to produce the oil. Scent: Hiba Wood Essential Oil has a strong woody scent reminiscent of Cedarwood. 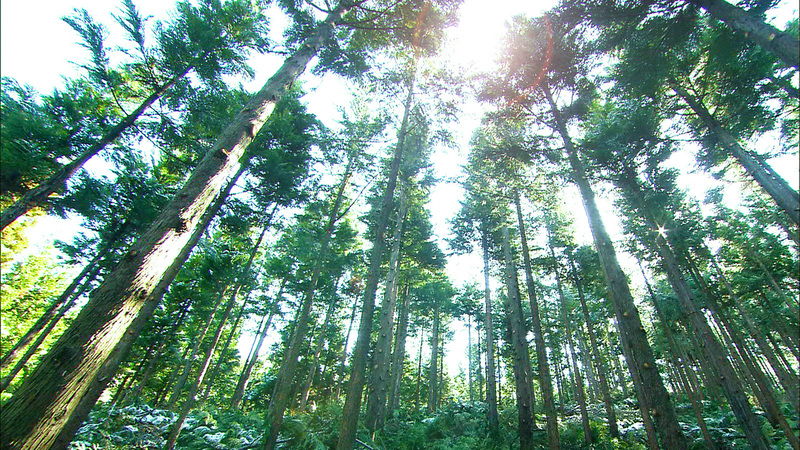 It is different from Port Orford cedar and american conifers as its content of pinene is low. Blends well with: Bergamont, Boronia, Clary Sage, Cypress, Calamus, Cassie, Frankincense, Jasmine, Juniper, Labdanum, Mimosa, Neroli, Rosewood, Rosemary, Vetiver, etc. Emotional description: spicy, musky, woody, oriental and mysterious. People who liked Hiba wood aroma also liked Hinoki, Shalimar, Obsession, Opium or Ciara. Cautions: Generally hypoallergenic, non-irritating and non-sensitizing. * When using directly on skin or scalp, try first on a small portion of your skin to see if any reaction develops. If you experience skin irritation, burning, itching or any other symptom, you might be experiencing an allergic reaction. Discontinue use until a doctor can perform a screen. * Pets: Avoid using hiba-oil (or any cedar extract product) as a flea treatment for cats, which are particularly susceptible to plant-oil poisoning. About dogs: verify the usability and dosage with your veterinary.